In this Jan. 10, 2017, file photo, pharmaceuticals billionaire Dr. Patrick Soon-Shiong waves as he arrives in the lobby of Trump Tower in New York for a meeting with President-elect Donald Trump. Soon-Shiong will take over the L.A. Times on Monday. Pedestrians look at news photos posted outside the Los Angeles Times building in downtown Los Angeles. 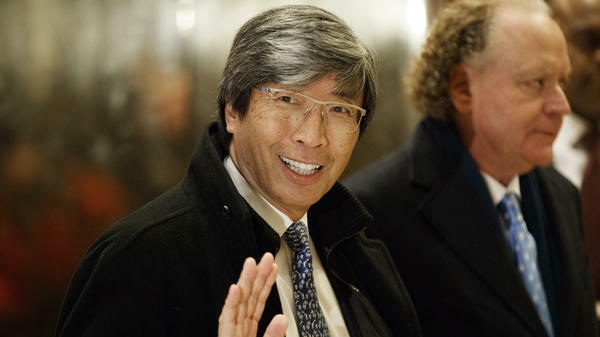 Pharmaceuticals billionaire Dr. Patrick Soon-Shiong will take over the LA Times on Monday. "I've not gone into this transaction from a financial basis at all. There's an opportunity to make a major impact on the nation," Soon-Shiong said. "LA Times is one of the three newspapers that can have a national and international impact." Soon-Shiong is spending $500 million to buy the LA Times, The San Diego Union-Tribune, Spanish-language Hoy and other community newspapers in Southern California from Chicago-based Tronc. 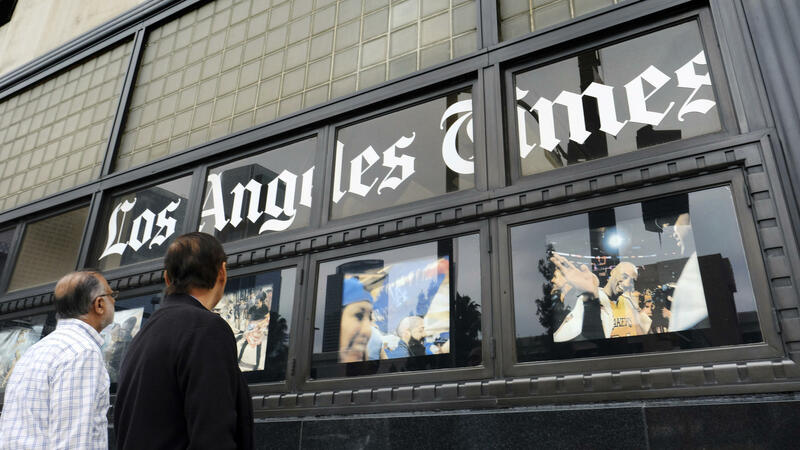 The deal, which was announced Feb. 7, returns the LA Times to local ownership after 18 turbulent years under Chicago control. Soon-Shiong is a multibillionaire surgeon, entrepreneur, philanthropist and part owner of the Los Angeles Lakers. He is also an immigrant, born in South Africa to parents who had fled China during the occupation by Japan during World War II. Tronc's decision to sell the LA Times to Soon-Shiong followed the suspension of its publisher and CEO over concerns of past workplace behavior, the newsroom's unionization and a series of other seemingly unrelated crises at the paper. Soon-Shiong told NPR he might revisit the question of buying Tronc's remaining publications — including the Chicago Tribune, The Baltimore Sun, the New York Daily News and other regional papers — months from now if he makes progress at the LA Times. He said he first wants to unravel many of Tronc's much touted digital initiatives and make promising new investments rather than the continual cuts the West Coast newspaper experienced under Tronc and its past owners. Soon-Shiong reportedly met with President Trump and his advisers in early 2017 and explored holding a policy position in the administration. But Soon-Shiong's attitude toward the press is in contrast to that of the president, as he told NPR that he counts on journalists to "speak on behalf of the people" in holding powerful figures accountable. He said he decided to "overpay" to buy the LA Times in February because of increasingly likely plans to kill the paper's Washington bureau. Soon-Shiong says his own record pursuing digital solutions for medical and health care problems has prepared him to launch the LA Times to greater heights. Not all of his ventures and activities have fulfilled their initial promise, and he has not always enjoyed the ensuing coverage. He said that he nonetheless would be transparent, offering his newsrooms the right to cover him in whatever ways they deem appropriate. In his first interview with a national news outlet since closing the deal, the 65-year-old Soon-Shiong spoke of his ambitions for the the LA Times, the need for independent reporting in the media, his clashes with Tronc, and how his youthful years in racist South Africa shaped his convictions about the importance of journalism. This has not been something that's been an overnight design. It's been something that's really been with me for a long time, as you may know. This industry needs to go through a transformation, where technology could be integrated together with news. Yet the core of the newspaper must be present. I have not gone into this transaction from a financial basis at all. There was an opportunity to make a major impact on the nation. LA Times is one of the three newspapers that could have national, international impact. I think we [LA Times] are truly the voice of — can be and should be — the voice of California, the voice of the West, and ultimately the voice of the nation. I think there's no place like California, where if you just look at Los Angeles, for example, it could be the sports capital of the nation with two baseball teams, two football teams, two soccer teams. ... It's the capital of the nation in terms of entertainment, and then it is innovation. ... I think as the opportunity arises we are uniquely Californian and uniquely the West Coast. I think the legacy of this paper, the storied paper and the storied institution really must be and should have been respected. So there was multiple disagreements in terms of how I felt when I made my initial investment. We had — and I mean still do have — an amazing ability to honor the legacy of the paper and honor journalistic integrity. And you begin to see that now with The New York Times and The Washington Post — they've successfully [done that] through great editors, executive editors like Dean Baquet and Marty Baron. So I think it's clear that I fully had multiple disagreements and now we have finally the opportunity to take what I consider the brand of the entire organization anyway, which was the LA Times and the [Southern] California News Group, and to build on that with great freedom. And I'm very competitive. ... We'll be as competitive vis-à-vis the The New York Times and The Washington Post. We're obviously now one to two years behind. But it won't take us long, I hope, to be as competitive and to be perceived not just as a regional paper but indeed a national paper and hopefully an international paper. On fake news as the "cancer of our time"
I think it's so important that when somebody picks up the Los Angeles Times and The San Diego Union-Tribune that the reader believes that whatever is being reported in terms of news is truthful. And I think truly that fake news is the cancer of our time, and the idea of what fake news is, is really ... sadly, there's the good side of technology and the dark side of technology. And with social media, the ability to spread information or disinformation is so dangerous. The strength of organizations like the LA Times, The New York Times, The Washington Post is this journalistic integrity and journalistic strength, right? And I think the power of investigative reporting must be really enabled so that we have truth, both truth to speak to power, but also truth in terms of inspiration and what I call speaking on behalf of the people. It's part of the business and the job of the paper. It's part of the freedom of democracy and freedom of the press to ensure that this truth be known. Having said that, it's really important that we also be known for fairness, meaning that there should no agenda either side one way or the other, other than from a reporting perspective to be completely truthful with highest integrity. And no interference whatsoever from ownership — complete independence of journalistic integrity. I grew up in the world of newspapers. It's hard to believe, but in South Africa where I grew up, I did not see TV until the age of 23. We grew up with newspapers and radio and that was a source of not only education information but inspiration. And in the world of apartheid, it was a powerful tool for freedom of the press and democracy. I mean I truly lived the American dream when you think about it. ... I was born in South Africa and my parents came from China when they fled the Japanese invasion. So I was first-generation South African and knew nothing else when I grew up. To me, apartheid was how I grew up. I was this young radical student in the world of apartheid in Johannesburg. And all I knew in terms of the dignity of the black people and how we would fight this issue of apartheid was from the press. And because of the freedom of the press, it helped inform and [it] inspired people. And I think that really was a part of it. Having said that, as a young teenager, part of my job was going to the Evening Post, which was one of the Port Elizabeth newspapers, in the evening. I literally would pick up the newspapers and run through the city and wait for the press to come off the printing presses. So it is in my blood, the newspapers was in my blood. I think we have to evolve where a correspondent now has to have the capability of creating the story, not only just for print but for podcasting and for even TV interviewing and for streaming and for tweeting. So it's a much different skill set that has to be adopted so that there are different generations that will consume news in a different way. But I don't think we'll lose or should lose our core strength as journalists with great stories to tell. In the last three months, in anticipation of the knowledge that we have to move out of the LA Times building, which we don't own, there's really a need to build what I call the modernized newsroom in which there is great interconnectivity across all the different vehicles. All of that would require massive investment. And since it didn't exist, it does not exist, even in any current state in any of the Tribune papers — whether it be LA Times, Chicago Tribune, The San Diego Tribune, The Baltimore Sun -- somebody had to step up and make that kind of massive capital investment [Soon-Shiong has spent millions to renovate an eight-story building, which will serve as the new headquarters for the paper. The building is in El Segundo, not far from Los Angeles International Airport]. I think we'll surprise you over the course of the next two, three months that we will reveal that investment we're making. But physical capital infrastructure is one piece. The real strength is going to be in the human capital of intellectually curious and intellectually honest strong journalistic skill sets. I have no desire to have any role or influence about anything they write about me. ... And I welcome that completely. I've invited every journalist to write whatever they wish to write about us good or bad. The only thing we ask whether it's me or anybody else is to be fair, meaning to write honest, truthful information. I've said in my town hall meetings to our journalists, they are free to write anything about me, about my companies, even about the Lakers, as long as it's truthful and fair.